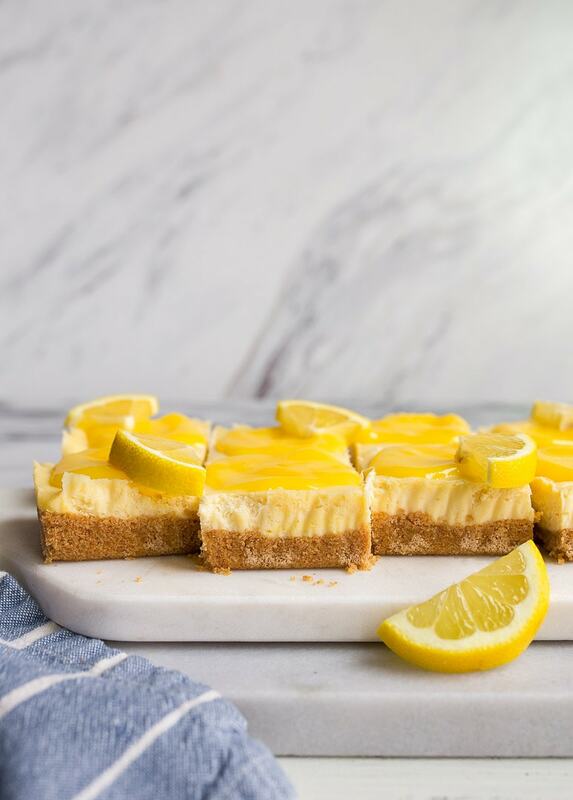 Lemon cheesecake bars with a graham cracker crust are the perfect summertime potluck recipe or lemon dessert for your lunch box treat. If you’re a fan of my small cheesecake made in a loaf pan (and so many of you are, yay! ), then your next cheesecake obsession starts right here. I actually halved that recipe to make an even smaller cheesecake for two. These lemon cheesecake bars with graham cracker crust have a nice layer of perfect cheesecake (that bakes up with zero cracks, I promise!) and a tangy little topping of microwave lemon curd. Since I’m in the business of scaling things down, you’re probably not surprised to see an even smaller version of an already small cheesecake. Gosh, I hope not! 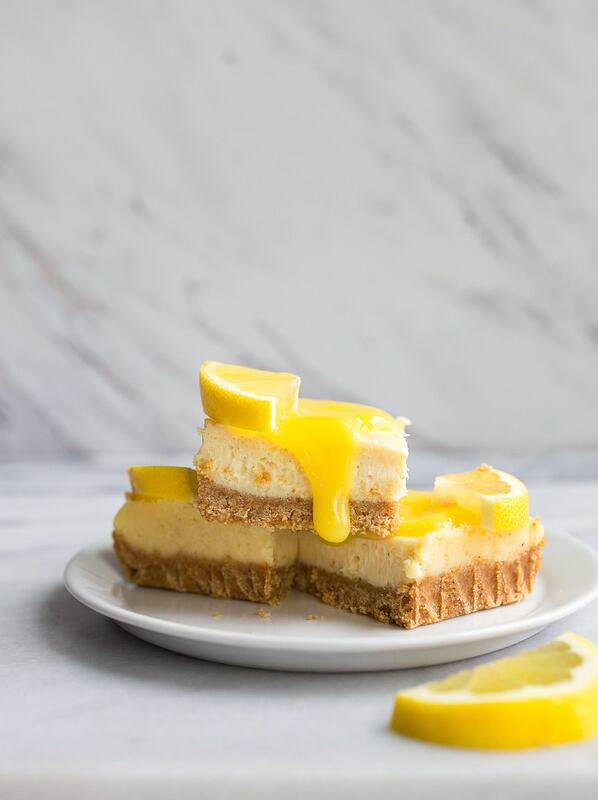 I wanted a little lemon cheesecake square that you could easily bring to a potluck or tuck into a lunchbox. These fit perfectly into a one of the squares in a bento box, which is both good news and bad news for me. I’d rather sneak an extra lemon cheesecake bar than an actual sandwiches sometimes. You know me. I bake this recipe in a standard 9″ bread loaf pan to get 8 small bites of dessert. I use it a lot for small batch desserts, and I’m thinking that key lime pie is our next venture! Would you join me on that one? You can absolutely use Nilla wafers for the crust instead of graham crackers here, about 1 1/2 cups of them. They require the same amount of butter to hold together as the grahams do. They’re slightly sweeter, so I would leave out the sugar, but that’s just me. One other recipe note: this recipe calls for just an egg yolk. I sorted all of my recipes that use egg whites. I also sorted by recipes that use egg yolks, too if you want to save that for future use! 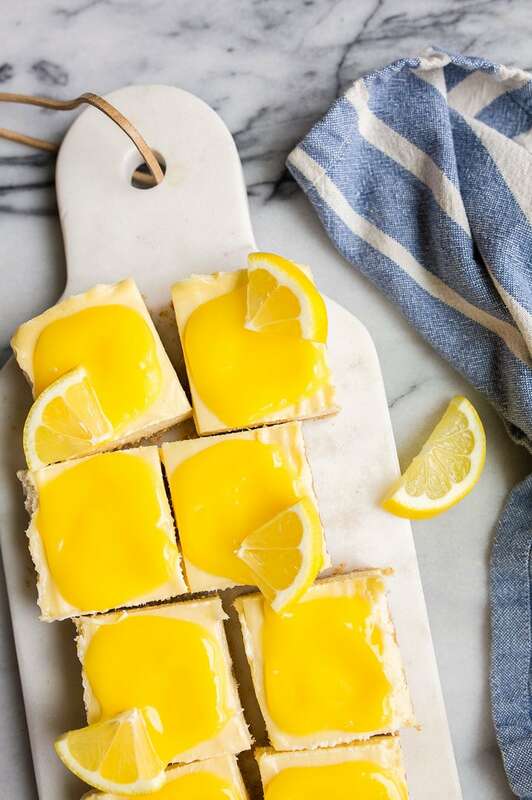 If you make these lemon cheesecake bars for a summer party, I would love to see! Tag me on instagram. Also, be sure you’re signed up to my weekly e-mail newsletter! 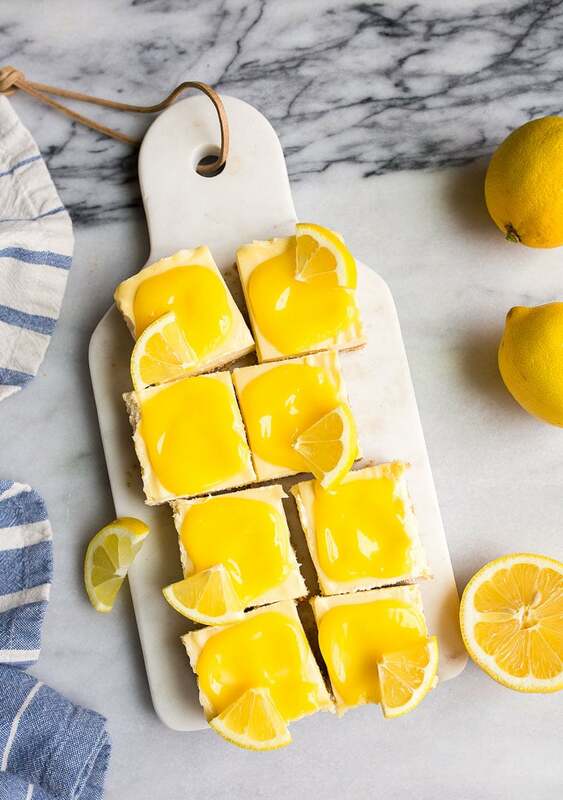 Lemon cheesecake bars with lemon curd. In the bowl of a food processor (or a plastic bag), crush the graham crackers into crumbs. Stir the melted butter and granulated sugar into the graham crumbs. Meanwhile, beat together the cream cheese and sugar until light and fluffy. Beat in the egg yolk, followed by the vanilla and lemon juice. Lower the oven to 300, and bake the cheesecake for 20-30 minutes, until the entire surface is set and not sticky. It will have a slightly golden yellow hue. A toothpick inserted should not come out with wet batter. Let the cheesecake cool near the oven (drastic temperature changes cause cracks in cheesecake). Once fully cooled, move to the refrigerator for at least 4 hours. 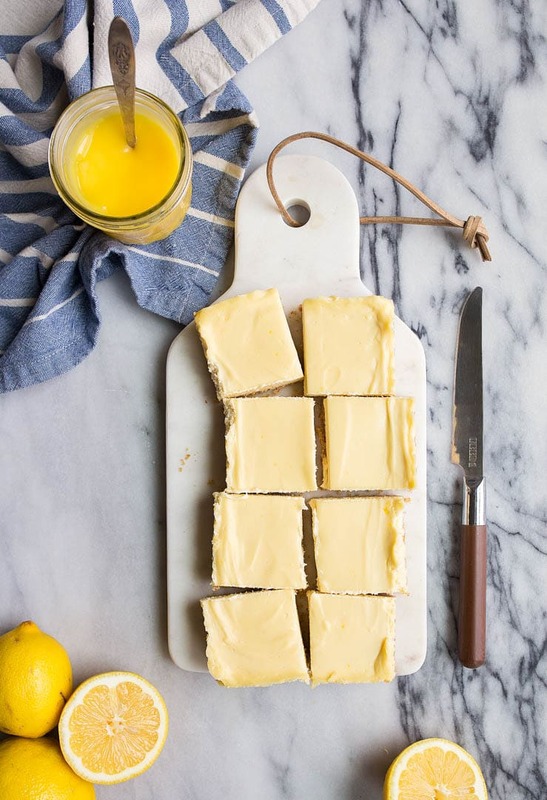 To serve, slice into equal-sized pieces, and top with the lemon curd. Yes! Key Lime Pie Please!! Key Lime Pie? Yes, please. I made these last night using the suggestion for a vanilla wafer crust, as I didn’t have any graham crackers. I also had an open package of 6 oz. of cream cheese, so I used that, and adjusted the rest of the ingredients also. I topped with Smucker’s Blueberry Lemon Jam because I couldn’t even bring myself to make microwave lemon curd (I know, I’m pathetic). This was delicious! I will make it over and over again! Thank you! This looks so much like summer laready! I love lemmon cheese cake! this is definitely a winner. Very simmilr to the one I usually make eggless (I change the egg mixture by neutral jelly instead) but the result is still divine,,, and so so refreshing, makes a perfect afternoon snack! As an empty nester I am always looking for recipes with smaller portions. 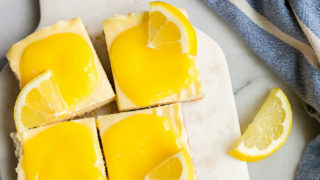 The lemon cheesecake bars fill that and more. They were delicious. I have to try the pasta salad next! Thanks for your hard work. this is a work of art, food art, and a great thing to serve at next dinner party, etc, it just looks so good, thank you! These are gorgeous, simple and look absolutely delicious! Love the lemony-ness of them – perfect for summer. Can’t wait to try these out!